Here you can post what do you think what are the post 'unique' animal/plant species on Earth. You need to tell something about them and also -if you want- you can put their picture(s). The Peacock Mantis Shrimp: The mantis shrimp is also known as “sea locusts“, “prawn killers” and “thumb splitters”. 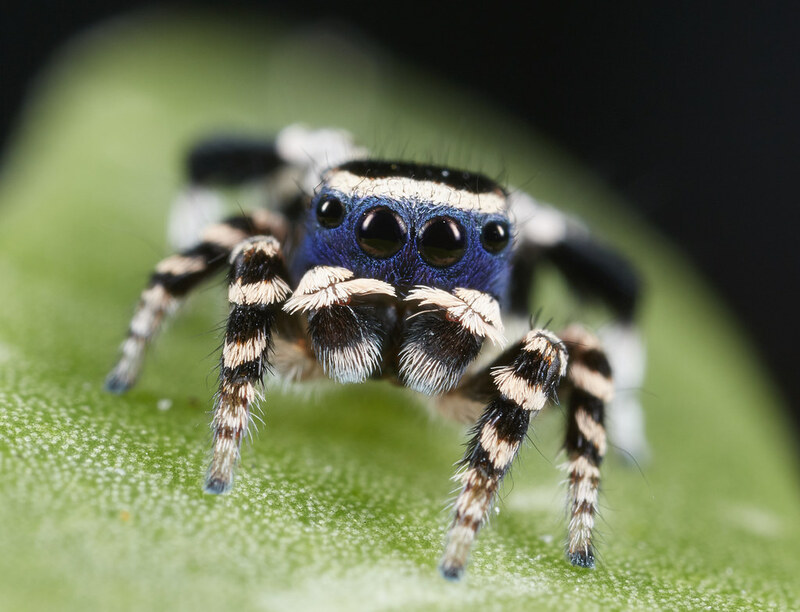 Their front claws can deliver a punch that is as powerful as a gunshot. The mantis shrimp can’t be kept in normal aquariums, as they punch through other sea life and even the glass. The Umbonia Spinosa: Scientists are baffled by this unusual creature, but believe it to be closely related to cicadas. The Umbonia Spinosa use their beaks to pierce plant stems to feed upon their sap. It’s hard to tell what you’re looking at with the spinosa, but it’s easy to tell it’s beautiful. The Lowland Streaked Tenrec: The Lowland Streaked Tenrec is cute, but you have to watch out for this creature found in Madagascar, Africa. It’s covered in tiny little barbs and it is reportedly the only mammal known to use stridulation for generating sound. Usually, only insects and snakes make that kind of noise. 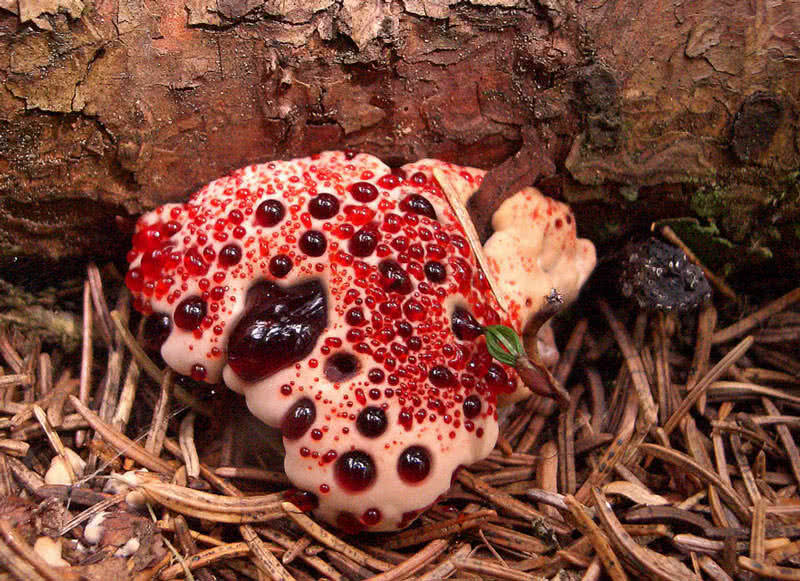 Hydnellum peckii: Hydnellum peckii is a special type of fungi that produce blood or juice like fluid on its surface. This plant is also known as ‘bleeding tooth fungus’. It is the Scarlet pigment causes blood like the color on the fluid of this plant. This strange plant mainly found across North America and Europe. It is edible, but the blood like fluid is extremely bitter in taste. Hydnellum peckii has an unpleasant odor. The color of fluids on Hydnellum peckii can be varied as orange or pink. the females are grey, and each one is only about 1/5th of a human thumb nail. They lift colorful flaps on their back and shake it, along with two of their back legs in the air. 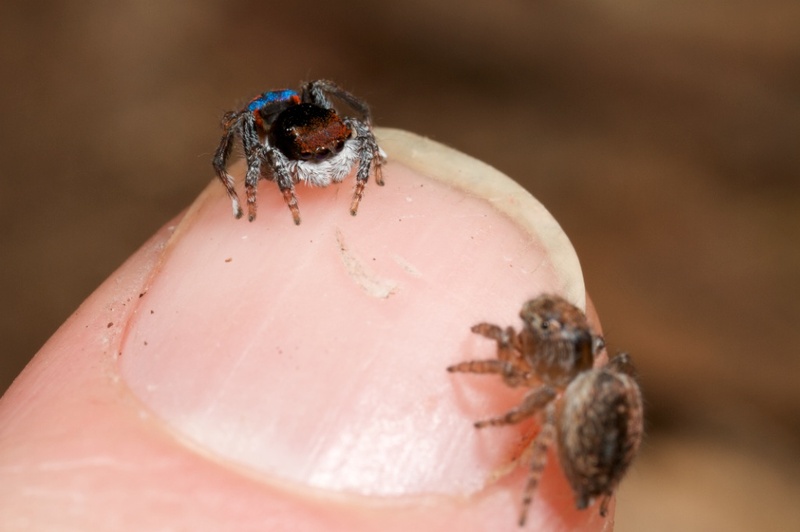 I HATE spiders, but these are pretty cute! 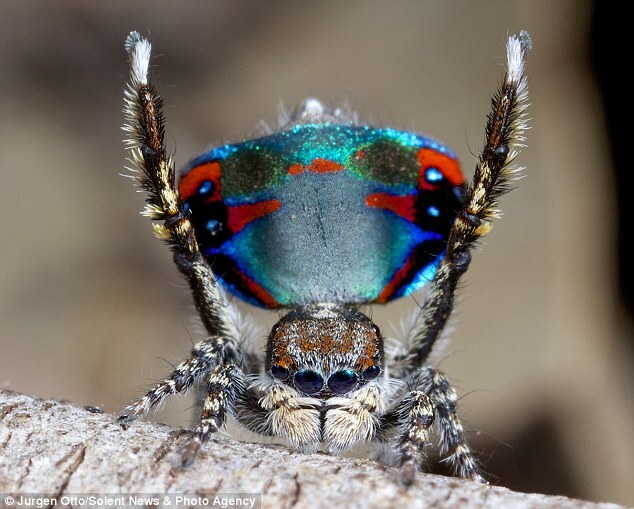 Colors of the flap and spider vary. Male is farther up, female farther down. It has a nose, and boxy head, along with only one 'skin'. It has a tuff of fur on its chin as well. 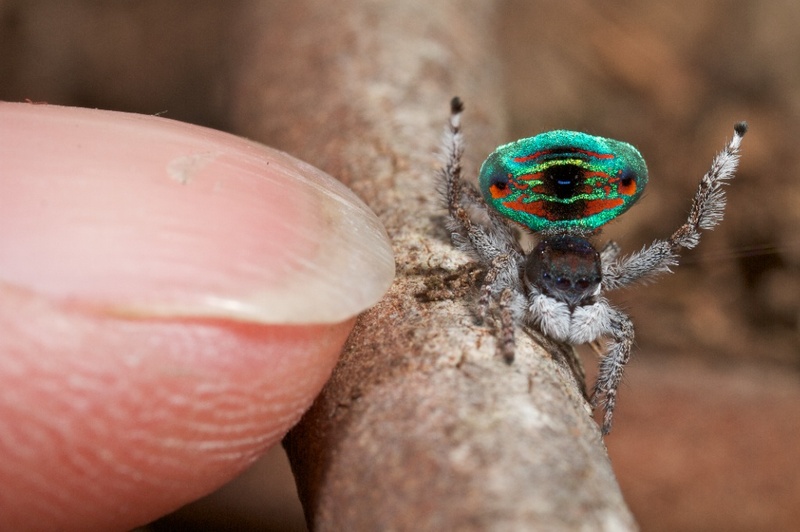 Same size as all other peacock spiders. 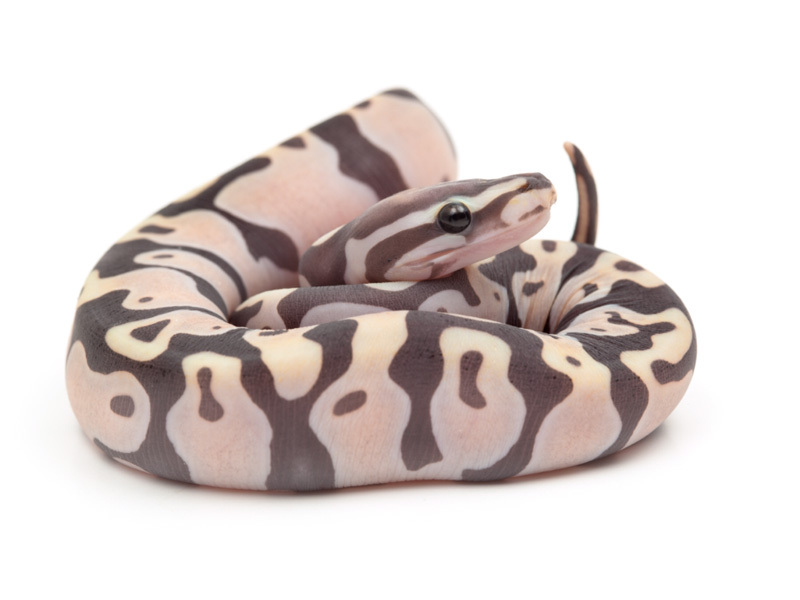 Then there's a "Scaleless Ball Python" a ball python morph (morph = skin) which is very rare and unique, because they have no scales! Just super smooth skin! 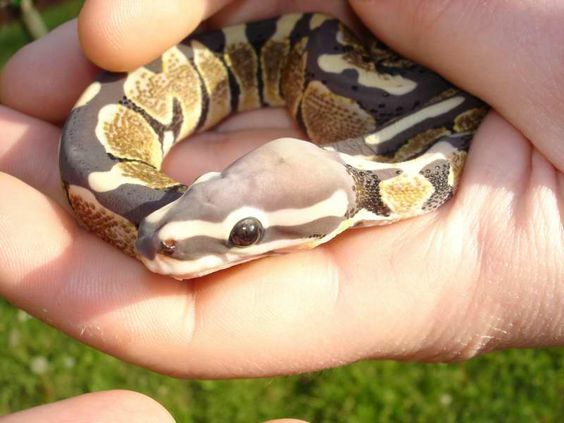 Ball pythons in general are interesting, so I well show 1 ball python picture, and 1 scaleless ball python picture. They have so many morphs, No one can count exactly how many there are! new ones are made EVERY day! 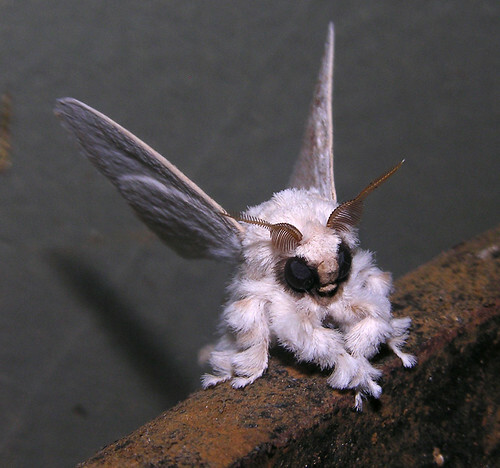 Even though i am TERRIFIED of moths, i personally think Venezuelan poodle moths are adorable! "The Venezuelan Poodle Moth — the almost unreal looking subject of the popular meme — is believe it or not, a real animal, not a hoax. The species was only recently identified, in 2009, but there are actually quite a few rather closely related moth species that look just as interesting/strange. The Vezuelan Poodle Moth — Artace sp, possibly A. cribaria — was first described in 2009 by Dr Arthur Anker of Bishkek, Kyrgyzstan, who found the species in the Gran Sabana region of Venezuela. 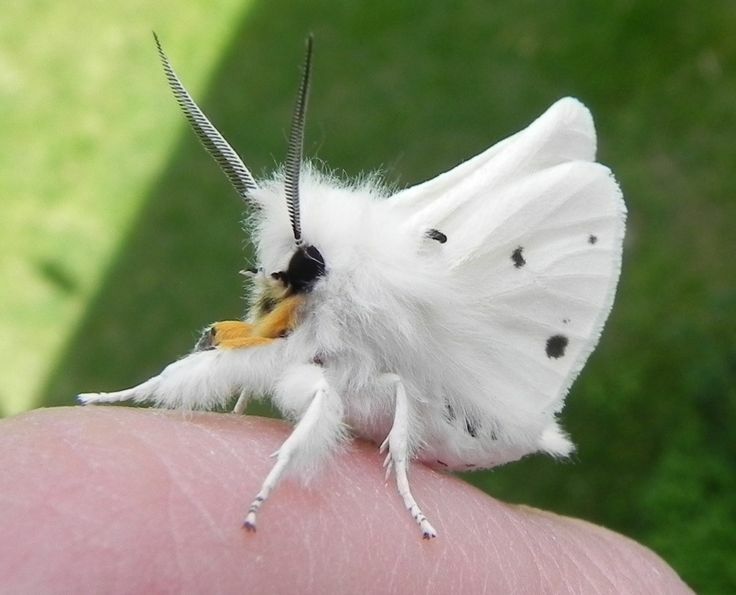 The species superficially appears to be closely related to the Muslin Moth — Diaphora mendica. 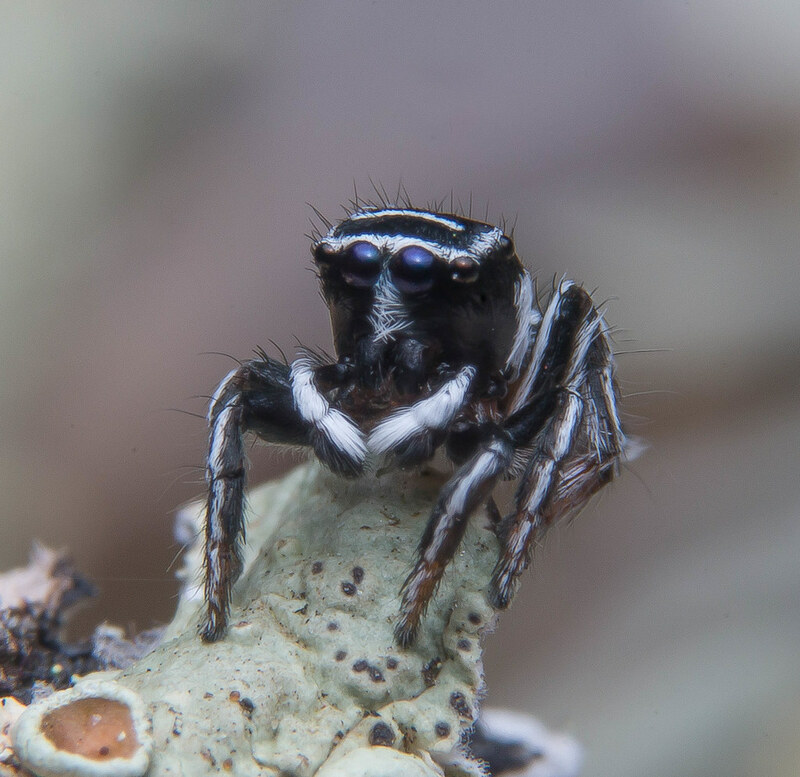 The species almost definitely belongs to the family Lasiocampidae, and most likely belongs to the genus Artace, or perhaps another genus closely related to Artace. While it’s possible that it may be a subspecies of Artace cribraria — which is presumed to range from northern North America down to to Argentina — it seems more likely that it may be a different species. There are somewhere around 10-15 South American species of Artacethat have been scientifically described so far, so it may be one of those, or possibly a regional subspecies, or a species which has yet to be scientifically described."